Evidence for elusive Majorana fermions raises possibilities for quantum computers. Getting into nanoscience pioneer Leo Kouwenhoven’s talk at the American Physical Society’s March meeting in Boston, Massachusetts, today was like trying to board a subway train at rush hour. The buzz in the corridor was that Kouwenhoven’s group, based at the Delft University of Technology in the Netherlands, might have beaten several competing teams in solid-state physics — and the community of high-energy physicists — to a long-sought goal, the detection of Majorana fermions, mysterious quantum-mechanical particles that may have applications in quantum computing. Kouwenhoven didn’t disappoint. “Have we seen Majorana fermions? I’d say it’s a cautious yes,” he concluded at the end of a data-heavy presentation. Quantum particles come in two types, fermions and bosons. Whereas bosons can be their own antiparticles, which means that they can annihilate each other in a flash of energy, fermions generally have distinct antiparticles; for example, an electron’s antiparticle is the positively charged positron. But in 1937, Italian physicist Ettore Majorana adapted equations that Englishman Paul Dirac had used to describe the behaviour of fermions and bosons to predict the existence of a type of fermion that was its own antiparticle. Over decades, particle physicists have looked for Majorana fermions in nature, and after 2008, condensed-matter physicists began to think of ways in which they could be formed from the collective behaviour of&nbsp; electrons in solid-state materials, specifically, on surfaces placed in contact with superconductors or in one-dimensional wires. Kouwenhoven’s apparatus is along the latter lines. 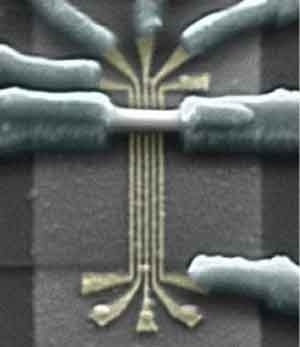 In his group’s set-up, indium antimonide nanowires are connected to a circuit with a gold contact at one end and a slice of superconductor at the other, and then exposed to a moderately strong magnetic field. Measurements of the electrical conductance of the nanowires showed a peak at zero voltage that is consistent with the formation of a pair of Majorana particles, one at either end of the region of the nanowire in contact with the superconductor. As a sanity check, the group varied the orientation of the magnetic field and checked that the peak came and went as would be expected for Majorana fermions………. Have we summoned the mysterious Majorana fermion? This entry was posted in High Energy Physics, QUANTUM PHYSICS, TECHNOLOGY and tagged Majorana, Quantum Computer, quantum computers. Bookmark the permalink.